Organizers say if they don’t get more donations, there might not be a festival next year. The 2017 fest will happen from May 26-29 at the Seattle Center. 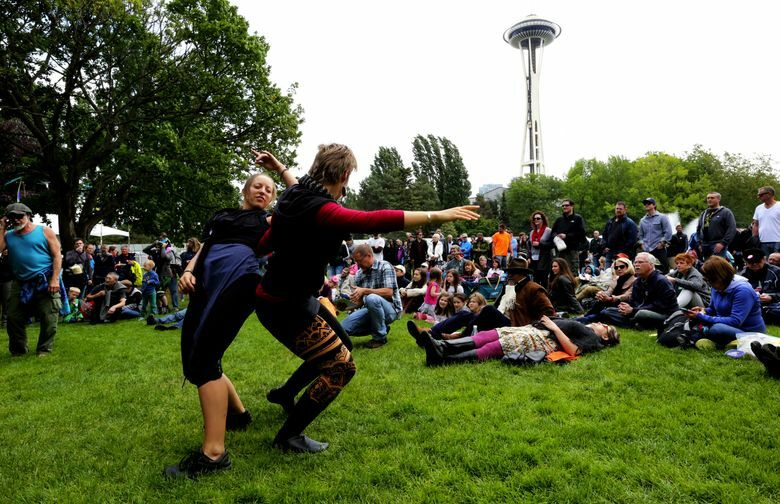 As it has since Memorial Day weekend in 1972, the Northwest Folklife Festival opens Friday, May 26, at Seattle Center, offering a colorful, community-driven kaleidoscope on 25 stages of 5,000 performers from around the world, including folk dancers and fiddlers, marimba and mariachi bands, storytellers and shakuhachi flute players. This year, however, anxiety lurks in the anvil chorus. Festival organizers say that if folks don’t start shelling out more and bigger donations when they come in, there will be no 2018 Folklife Festival. “If we don’t make our goal this year, there’s no money to move forward,” explains interim Executive Director Mark Crawford, who came on board last fall after Robert Townsend resigned. 11 a.m.-10 p.m. Friday-Sunday, May 26-28, and 11 a.m.-9 p.m. Monday, May 29, Seattle Center; $10 individual, $20 family donation requested (206-684-7300 or nwfolklife.org). Crawford, 59, who has worked in the arts locally for years — notably as associate managing director of A Contemporary Theatre in the ’90s — says donations at the entrances usually come in at around $190,000. That figure needs to rise to $350,000. Though Folklife has a healthy core of support from 1,000 “Friends of Folklife,” who contribute as much as $300,000 every year, Crawford says only 17 percent of patrons give anything at all when they walk in. For the past few years, Folklife has dealt with income shortages by trimming expenses. But with only three full-time employees (from a high of 10) and an annual budget of $1.3 million (from $1.7 million), no more cuts are feasible. As always, there are plenty of reasons to drop a few dollars at the gate. This year’s programs include a Cultural Cuisine Stage, featuring cooking demonstrations from around the world, a Northwest Craft Beer Festival and cutting-edge programming in the KEXP Gathering Space. Folklife is also celebrating the 20th birthday of Seattle Center’s Festál, which honors various community traditions, including the Diwali Festival of Lights, Brasilfest, Festival Sundiata and the Iranian Festival. But whether you single out specific concerts or just wander the grounds, there’s always something diverting to see or hear or do at Folklife. This year, however, it’s going to cost you a few bucks if you want to be sure it’s still around next year. Paul de Barros: pdebarros@comcast.net; on Twitter: @pdebarros. Paul de Barros is the former Seattle Times pop music coordinator.